Here in New Jersey, we're expecting a major snowstorm to begin tonight, with possible accumulations up to two feet. I'll be peeking out the window tonight, likely at 2:00 or 3:00 in the morning (I don't sleep much), while I'm intermittently reading, finishing some needlepoint, or scribbling feedback on student work. But in the background: my own version of nostalgia TV, shows from the 1960s and 70s. I don't have to watch every scene, because I know those characters, I love those characters; I'm comfortable in their company. Recently, I started to think about why. And so of course I wrote about it. 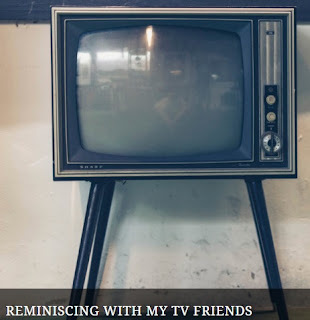 The essay, "Reminiscing with my TV Friends," appears today at The Sunlight Press. "...I began to linger. Then to seek out those old shows. Slowly, I understood: I was revisiting a time when I had a beautiful mother who walked this earth, a time when a cool aunt waited for her pimply chubby niece on Saturday nights, a time when a kind father never ran out of time for me, when my lovely now-67-year-old sister was as fresh and young as Patty and as unlined and peachy as Laura Petrie. I’m revisiting, even more than all of them—myself." You can read the entire (short) essay here. Short pieces like this, which is just under 750 words and is often called "flash nonfiction," will be part of the focus of a day-long writing event I'm leading in early May.